Depending on where you live the weather can get nasty in the winter. With rain, sleet, snow and more it can put a lot of strain on an uncovered entrance. We had this problem at our house. We would get home from work and the snow would have built up on the porch we use to get inside, and then the snow would fall right inside, and it was a constant clean up issue, or the door would not close again afterwards for the ice jammed in the hinges. We always had to seal it to keep the wind and weather out and it took a beating. We decided adding a porch enclosure would give us extra space and take the pressure off that back door that we always use in the winter. Even in the summer the rain would come in at an angle and our back hall was already crowded. We looked into having one added by a contractor and it was stupid money including foundation digging and extra work. That is when I came across these sun room kits or also known as porch enclosure kits as they attach to the house or right beside it. They are cheaper than adding another room using a contractor as long as you have a good deck or patio, and depending on your location and weather scenario will last a good long time. I found these examples already and am quite excited to not only give our back door protection but also have a screened in area for extra living space in warm months that is more affordable than a contractor. Add a Room Solarium - Polycarbonate Roof - My Personal Favourite! I am seriously thinking about this one for our side door. Not only can it protect the door we use all the time from the weather, it is also additional room for sitting but in a smaller size as we are limited space at that point. You can get these in different sizes and the doors can be moved around. We can store our coats and boots in this area and spread out from the crowded hallway. These kits come with everything you need. 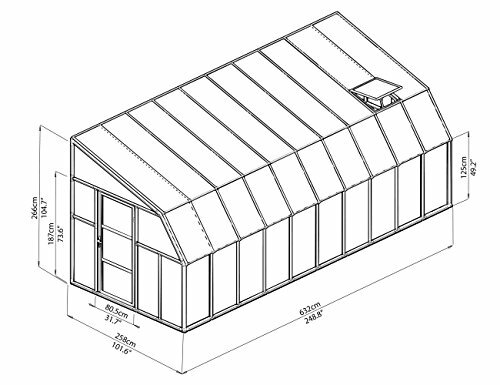 For us this would work best as we don’t want the roof to be glass just the sides, as this area gets a lot of sun already. It would look tasteful and not interfere with the yard. We already have a concrete patio area there so this would be the perfect addition to our home. If you love the idea of light coming in all over, then you may prefer this model. 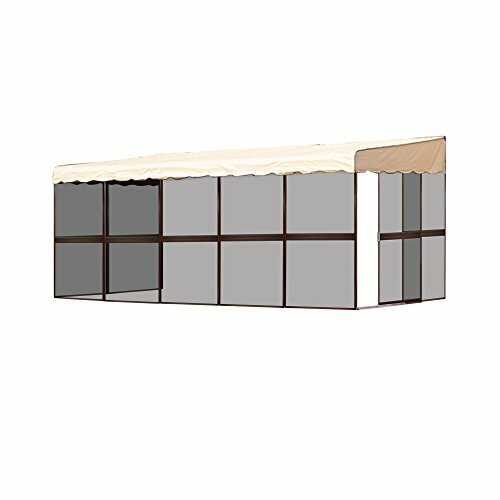 It is durable and basically fits right on your present patio and has light at all angles. You can get different sizes that allow for more space for enjoying outdoor living and there is ventilation to let out excess heat. I don’t see any screens in this model other than the roof vents. It all depends on what you are looking for. But the frame is a heavy duty resin frame for years of no maintenance. 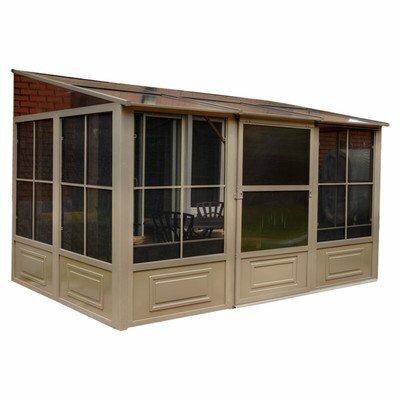 This has a heavy duty galvanized frame, and lots of screened areas include the sliding doors. If you simply want a place to enjoy an evening bug free, this would work well. It has a vinyl roof and would work well attached to house or even an RV. This would protect you from some weather but not all of it. It all depends on what your needs are. Might be a good idea for cottage country too where the bugs are plentiful. This is a larger model that fits on any existing deck or patio. It can give you that protection from weather and has vents to let out extra heat and is UV protected. Imagine just how much light would enter this space and will give you an area to spread to from the house. This is a much larger addition. If you have the room you can enjoy extra living area all year round or for at least 3 seasons depending on your climate. There are three large screened doors to let the outside air in and keep the bugs out. 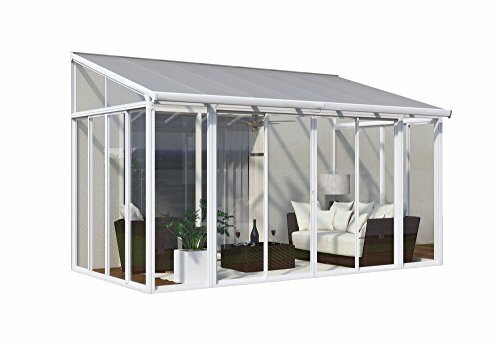 You could still use this as a patio without having to worry about weather on your furniture. It is a beautiful bright room with a solid roof. You could decorate it and express your personality with a cool ceiling fan to help keep the air moving, it can be a fun room to kick back and relax. This could be an affordable way to get that extra space or in my case some added protection for our main door. These are a tasteful and yet elegant way to add extra room or for protection. In my case it is to protect the back door that we use all the time for our entrance especially in the bad weather and a place to store coats, boots and added accessories, but can also be the perfect spot to sit and enjoy that early spring or late fall or all summer long against bugs. 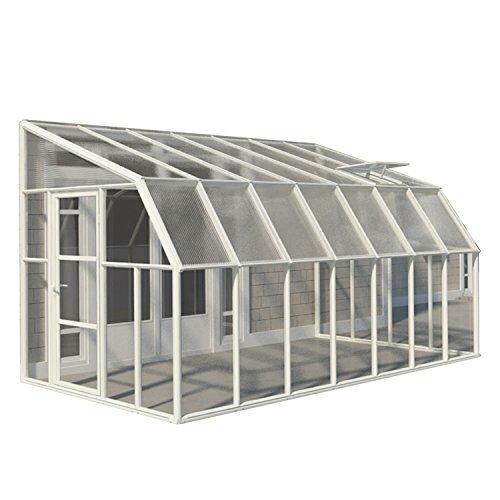 If you wish is simply to sit outside without those pesky bugs, then a full screen version will work, but if you want to use it all year round for door protection or for enjoying and adding more square footage to your home that you can decorate and have fun with, then there are many models to choose from. These are kits that make it easy to install, no fuss no digging, just a quick add on that is tasteful and decorative and totally usable!